“Agreed, ” said master builder Leiard, constructor of bridges and palaces of almost proverbial elegance. “A bird could get lost here with all these towers blocking the sky. And yet the Caliph, gods bless his reign, still wants more – and pays more for a bunch of towers than some other regents pay for a whole capital, too.” Engineer Timanis, who had built the Glass Mausoleum of Skuld, grinned knowingly. “But what could he possibly be compensating for?” asked Faraiel, a short and stocky man whose genius for architecture, the others had long ago agreed, did not extend to any other mental activity. “He has all the riches and power he could want.” Timanis leaned closer to him for a moment and whispered into his ear. Understanding shone in Faraiel’s eyes. 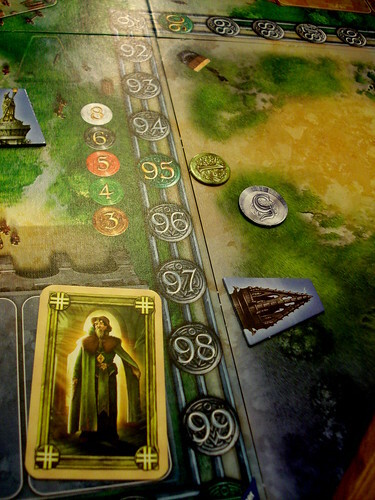 Asara is a game about building spires. Why? Because the Caliph likes spires, and that’s reason enough for us. That and the drive to prove that we are better tower-builders than everyone else, to prove we build more towers, higher towers and more colourful towers than everyone else. And that’s it as far as the background story goes. The game begins with finding a suitably large table to play on. That may not sound like a big deal, but proves to be a small challenge on it’s own because Asara takes up slightly more space than Kingsburg, our previous gaming table size-check. The board is octagonal – a first for us – and beautifully illustrated, but it is big. And next to the board you still need space for your player screen and to build your towers. So don’t try Asara at your local Starbucks. Since we’re building towers without any deeper reason, you’ll be eager to learn how to construct them. The Caliph in his unending wisdom has set us up with everything we need for that: workers and money. Workers are represented by cards in your hand; when it’s your turn you place one of them one one of the areas of the board and let them do their job. Most prominent – and most spacious – are the four markets. The city of Asara produces spires on an industrial scale and aren’t bothering with bricks and mortar any more. You go to one of the four markets to buy a base, a top or two different kinds of floors for your tower – the difference between them only becomes important in the advanced game, so for now just accept that there is two markets for floors. Sending your worker here lets you buy one tower piece http://www.flickr.com/photos/meoplesmagazine/5869023077/in/set-72157627043449274/from the display. The costs are the same for all parts of the tower and only differ by colour: white are the most expensive ones at eight asari, brown are the cheapest and go for three. When you buy a tile, it disappears behind your player screen. At this point, the other players are starting to hate you already because the first worker in an area of the board determines the colour that may be played there. Other players must follow suit or play two workers of any colour to make use of that area. Of course, even if they have the right colour workers they will still hate you because the space in each area is very limited. Also, the parts on display are only replenished at the end of the year, so you may have bought the one piece they really wanted. Now that you have spare parts for a tower, you will want to erect – stop the sniggering there in the back row, please – them. To do that, you send a worker to the central area. Here, there is seven spaces for workers, numbered from one to seven. Placing your worker in any of those spaces forces you to pay that many asari and allows you to build up to that number of tower parts – that means that your only option when the space you wanted is already taken is to pay more. Building towers is very easy as well, as long as you follow the caliph’s laws: towers may never be built from more than one material and towers must always have a base and a top – the caliph hates seeing unfinished things. With one building action you can work on as many towers as you like (and can afford), you can have multiple towers of the same colour and you can (and should) add floors in the middle of a tower – not the most efficient way to build, but at least it doesn’t violate the caliph’s law. When you build towers, you immediately gain one point of prestige (aka victory point) for every part built. Of course, it may happen that the part you really wanted to add to your tower – the one with the marble floor and the Jacuzzi – is not on display right now. In that case, you can bribe one of the store employees and show up at the back door in the middle of the night with a few hundred slaves and buy a piece that is not officially for sale – or, if your against slave labour, just look through the draw pile for that market. The first player to do this pays three asari on top of the price, the second player pays five. Right next to those two spaces is the one to acquire the caliph’s favour; sending a worker here makes you the starting player for next year. A lot of those actions sounded rather expensive, didn’t they? Maybe some more money would be good. Fortunately, the last area of the standard game is the bank. Three players can go the bank for a gift – it’s not a loan since you never pay it back – of twelve, ten and eight asari respectively. When all bank spaces are full, you can still go to the shady money-gifter – again, he’s not really a lender – next door for five asari. This is the only space where the worker’s colour doesn’t matter and that can also hold more than one worker. A very popular place to use your remaining workers at the end of the year. A year ends when all players used up their worker cards. Now the yearly scoring happens, a straightforward affair: each player gains one point per tower and one point for each gold ornament on his towers. For both things all the player’s towers count, not only those constructed this year. The player with the caliph’s favour gains one additional point. Now all worker cards are removed, all markets are restocked and each player gets an additional 20 asari for the new year. Four years are played out as described, then the game ends in a final scoring. The final scoring is a bit more intricate than the yearly scorings. In each colour, the tallest and second-tallest tower gain points, in the same order as the part prices. The white towers gain twelve and six points, the brown ones only four and two with the rest falling in-between. 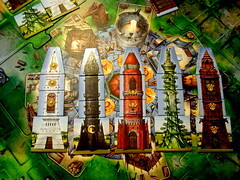 The tallest overall towers win eight and four points and the players with the most towers win twelve and six. Some intricacy enters the rules when it comes to ties: if there is a tie for the first place of any score, then the points for first and second place are are added up and split between all spires involved in the tie. On a tie for second place, only the points for second place are split between all spires involved. The player with the highest score – naturally – wins. Scoring gets a bit more complex still when playing with the advanced rules: one additional option here is to buy lighted windows. Lighted windows are built like the other parts of the tower, but they do not make the tower higher. Instead, they are build over a windowed floor – this is where the difference between the two kinds of floors comes in. A lighted window does not score by itself, but in case of a tie on the final scoring the tower with more lighted windows gets the higher score. The other addition in the advanced game is the option to send a worker to hire more workers. Some money and a worker card gets you two new worker cards here; very useful for the additional action, but even more useful for finding at least one worker in a colour you can actually use – because, trust me on that, you will never have the workers you want. Asara is, above all, a game of prioritisation. Deciding what to do is important, but more important is the decision what to do first. Being the person to set the colour for an area is a huge advantage – except for your personal relationship to the other players – and when you have many workers of one colour spreading them everywhere to force the other players into playing two worker cards there – effectively forfeiting one action – is a viable strategy. You need to try and be one step ahead of your opponents. Do you suspect they will take money from the bank on their next turn? Better do it now. Nevertheless, long-term planning does have its place in Asara as well: decide early which tower colours you will compete for the highest tower in to save you from buying superfluous parts. And, definitely not least, Lady Luck does have her place as well because a bad hand of workers or a bad selection of tower parts in the last year can ruin your best plans. I’m torn about the advanced game. One addition – the ability to hire more workers – adds strategic depth. Having an additional action is never bad, and a lucky draw of colours can really boost your chances. But in return you’re not doing anything else now, giving your opponents the chance to lock you out of the actions you still desperately wanted. This addition improves the game in matters of fun and depth. 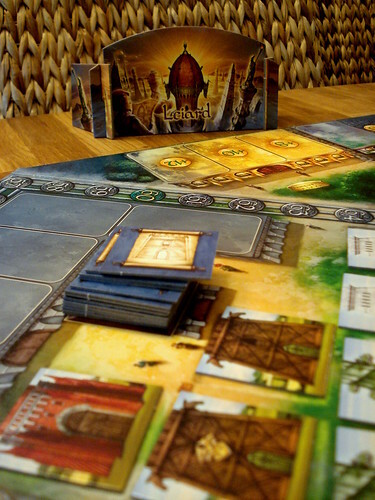 The lighted windows, on the other hand, do not improve Asara: they are too focused on playing for ties, and if the player you are currently tied with manages to build another unlighted floor in his tower, he will still win. They give you something to do with the last two workers when you hope the other players won’t be able to react any more, but building them just doesn’t feel satisfying. 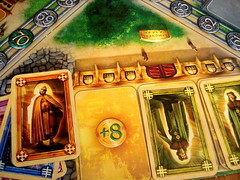 I like Asara best when playing “half-advanced”: with additional workers but without lighted windows. Criticism on the advanced rules aside, Asara is a solid game. It doesn’t break new ground in anything, but the mechanics work together well and things are finely tuned to never give everyone enough space to build their towers without interference. Due to the different number of workers, this lack of space comes to bear in any number of players and makes Asara work very well – and feel very similar – with two to four people. You may now go purchase a bigger table. With many thanks to Ravensburger for supplying us with a review copy. Leiard walked out of the Caliph’s throne room, followed by twelve slaves carrying his reward. He looked around nervously and it took all his self-control not to break into a run. Ever since Faraiel’s house had been buried by a sandstorm with him and his whole family inside – with none of the neighbouring houses having as much as a grain of sand blown on them – Leiard had only opened his mouth to eat, least he let slip the word “compensating”. Now everything was prepared for a long voyage to the north, to explore the interesting properties of ice as a building material. Just as he was reaching the palace gates, the voice of one of the Caliph’s many wives called out to him.